Saturday/Sunday, August 30 - 31, 2008. In 1997, through pure brainwork and without the use of modern computer, the globally-acclaimed Nigerian mathematician and academic, Chike Obi, who has died aged 87, solved the mystery of a 361- year old mathematical puzzle known as Fermat’s Last Theorem. The theorem, well known among scientists down the ages, was pioneered by the great 17th Century French mathematician, Pierre de Fermat. It stated that equation xn+yn=zn; where x,y,z and n are positive integers, has no solution if n is greater than 2. Obi’s seminal work carried out at his Nanna Institute for Scientific Studies in <?xml:namespace prefix = st1 ns = "urn:schemas-microsoft-com:office:smarttags" />Onitsha, Eastern Nigeria, gave the world an elementary solution to the ancient mathematical problem. Obi was a man of many parts, he was an accomplished politician before and after Nigeria became a sovereign nation. He was also a national newspaper columnist in the 1980s, writing under the title, "I speak For the People." 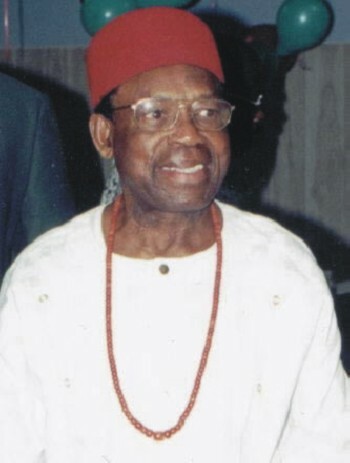 Chike Edozien Umezei Obi was born on April 17, 1921, in Zaria, Northern Nigeria. He was educated in various parts of Nigeria before reading mathematics as an external student of the University of London. Immediately after his first degree, he won a scholarship to do research study at Cambridge University’s Pembroke College, followed by doctoral studies at Massachusetts Institute of Technology, Cambridge, USA, becoming in 1950, the first Nigerian to bag a PhD in mathematics. Obi returned to lecture at the premier Nigerian University of Ibadan. He had barely settled down to academic life at Nigeria’s premier university, before the country began its agitation for independent from Britain. With other notable Nigerians at the time, he helped form the Dynamic Party of Nigeria, of which he served as its first secretary-general. After the party merged with the larger National Council of Nigerian and Cameroon, Obi was elected as part of the Nigerian delegation that negotiated the country’s path to self rule at two London conferences in 1957 and 1958. After Nigeria’s independence from Britain in 1960, Obi was elected a legislator in the Eastern House of Assembly in 1960, he refused to vacate his seat in the national legislature in Lagos, the Speaker of the regional house ordered that Obi be physically removed by security agents. This order was obeyed and Obi decided to commit himself to regional affairs. When the Civil War broke out in 1966, Obi pitched his tent with the Biafran side, working for the rebel leader Odemegwu Ojukwu. After the war, he returned to lecture in 1970 at the University of Lagos where he quickly rose to the senior academic role of a professor. But for a brief period in the 1970s when he served in the National Revenue Mobilization Commission, he was a university teacher until his retirement as a an Emeritus Professor in 1985. He left Lagos to return to his root in the city of Onitsha, establishing the Nanna Institute for Scientific Studies. In 1997, it was from the institute that he worked unaided with modern technologies to solve the four-century old mathematical puzzle known as Fermat’s theorem. Prior to that, he had won the globally-renowned Sigvard Ecklund Prize for original work in differential equation from the International Centre for Theoretical Physics. Obi’s devotion to the field of mathematics is matched only his commitment to the unity of Nigeria. He derided religion and ethnic extremism, and the culture of corruption pervading the Nigerian political class. A visiting professor to the University of Rhode Island, USA, the University of Jos, Nigeria, and the Chinese Academy of Science, Obi was a recipient of the national honour of Commander of the Order of the Niger (CON) and a Fellow of the Nigerian Academy of Science. A strict disciplinarian to his students, Obi is the author of several books and journals on mathematics and Nigerian politics. He died on March 13, 2008, and is survived by his wife Melinda, a fellow mathematician, and four children.